BOULDER, Colorado - Following roughly two months of notable operations at asteroid Itokawa, Japan's Hayabusa probe is damaged goods. Hindered by thruster and gyroscope breakdowns, the spacecraft is under makeshift attitude control with engineers hoping to finesse the craft onto a homeward-bound trajectory back to Earth. On Wednesday, the Japan Aerospace Exploration Agency (JAXA), announced that the troubled spacecraft would not begin its return flight back to Earth for at least another three years, owing to critical system failures including a fuel leak. Hayabusa was to begin its trek home in mid-December, when Earth and the asteroid it now orbits are at a relatively close distance. The probe was to drop a capsule in the Australian outback in June 2007. 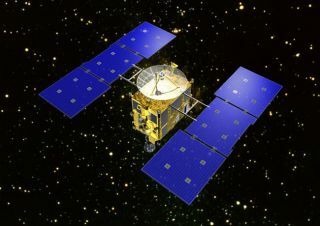 Whatever its destiny, Hayabusa, has generated priceless data for future treks to similar objects--by robots and humans. The intrepid robot is a heads up, not only for how best to utilize asteroid resources, but also to spoil a space rock's aim if found to be on a direct-hit heading for Earth. Now some 180 million miles (290 million kilometers) distant from Earth, Hayabusa is over 340 miles (550 kilometers) away from Itokowa, chugging through space at a modest three miles (5 kilometers) per hour. A turning on of the craft's propulsive ion engine this week is planned. Hayabusa is a project of Japan's Institute of Space and Astronautical Science (ISAS), a research arm of JAXA. The multi-tasked robot not only deployed hardware atop the space rock. It made repeat touchdowns on the asteroid too. But whether it succeeded in bagging specimens of Itokawa--a goal of the complex mission--remain unclear. During operations at Itokawa, the probe released an ultra-small MIcro/Nano Experimental Robot Vehicle for Asteroid--MINERVA for short. But it was released too high above the asteroid with the camera-carrying device never reaching Itokawa's rock-strewn surface. When it arrived at its target in September, Hayabusa began a close-up imagery sweep of the potato-shaped Itokawa, roughly measuring 1,800 feet (549 meters) long by 590 feet (180 meters) wide. "The rocky and rough surface of the asteroid was surprising," explained Donald Yeomans, Supervisor of the Solar System Dynamics Group at the Jet Propulsion Laboratory in Pasadena, California. "The 16-minute light travel time [between Earth and the spacecraft] makes real-time communications very difficult." The Hayabusa team did manage a near perfect touch-and-go operation on November 15, Yeomans pointed out, but the subsequent communications with the spacecraft was well below the nominal rate of data stream. Yeomans said that touching down on the surface of asteroid Itokawa was a tough assignment. "The Hayabusa Operations Team changed strategies and plans as they learned more about the navigation of a spacecraft near a nearly mass-less body," he said. Hayabusa operations spotlighted that rehearsals were very important for touchdown on the small asteroid, Yeomans said. "My personal opinion is that results from the Hayabusa mission can be used to engineer more robust strategies for future asteroid rendezvous missions," said Daniel Scheeres, Associate Professor of Aerospace Engineering at the University of Michigan in Ann Arbor. Scheeres said that the Japanese probe is a true "pathfinder" and an important technical demonstration mission. "The results from the current mission will be essential for developing a better understanding of the actual asteroid environment, and for making large advances in asteroid science," Scheeres told SPACE.com. "Clearly, the lessons learned from this mission will fundamentally influence all future asteroid rendezvous missions," Scheeres said. Over the years, various schemes have been proposed to deflect an asteroid found to be scary to Earth. Blasting an asteroid with focused sunlight, strapping rocket motors to one, detonation with with a nuclear bomb or just smacking it via a kinetic impactor similar to that used during NASA's Deep Impact mission in July--all these and other techniques have advocates and detractors. What's needed, however, is better understanding of asteroid structures before a deflection is undertaken. The Hayabusa mission has been closely monitored by officials within the B612 Foundation, an organization with the goal of significantly altering the orbit of an asteroid, in a controlled manner, by 2015. The group's name stems from the asteroid home of the Little Prince in Antoine de Saint-Exupery's child's story: The Little Prince. The foundation advocates honing the capability and technological wherewithal to anticipate and impede Earth-impacting asteroids. Of late, the group has been on the campaign trail to call attention to asteroid Apophis. The object makes an exceptionally close flyby of Earth on April 13, 2029. More importantly, this passer-by might have its trajectory altered during the swing-by, possibly putting it on a devastating direction toward Earth seven years later. The B612 group has advocated placing an active radio transponder on the object. Doing so at a fairly early date would yield the requisite orbital accuracy of the asteroid as it careens through space. It is no wonder that B612 Foundation chairman, Russell Schweickart, a former Apollo astronaut, has been keenly observing Japan's Hayabusa mission, the loss of the MINERVA, as well as the touch-and-go cosmic choreography done by the probe. "Things don't 'fall' normally around small cosmic bodies," Schweickart told SPACE.com from his office in Tiburon, California. "The local gravity is so low that any lateral velocity has an exaggerated effect. The behavior of objects around asteroids is counter-intuitive, if not absolutely chaotic," he explained. "Because of this low gravity, we B612'ers talk about 'docking with' a near Earth object and not 'landing on' one," Schweickart added. In fact, NASA astronaut Edward Lu--on the B612 Foundation's board of directors, recently co-authored a plan with fellow astronaut Stanley Love for a "no touch" asteroid tractor. The idea is to use gravitational forces of a spacecraft to ever-so-slightly pull an asteroid into a non-threatening orbit if the object was indeed found to be on a collision course with Earth. Schweickart said that he's eager to learn more about what Hayabusa was able to glean about its asteroid target, from finding out the mass of the space rock and its spin rate, as well as the orientation of the spin axis of Itokawa. "These are the sorts of parameters that we would have to determine prior to docking in preparation for an 'asteroid tugboat' type operation." Schweickart added. "Of course, for the stand-off gravity tractor, these things are not necessary bits of knowledge...only interesting." In some ways, deciphering genuine difficulties encountered by the Hayabusa mission itself from glitches in spacecraft hardware has been tough to do. Still, it is apparent that Hayabusa has offered both important science data regarding asteroids, as well as information on how to operate spacecraft around and on the mini-worlds, said Clark Chapman, a planetary scientist here at the Southwest Research Institute's Department of Space Studies. He is also on the B612 Foundation's Board of Directors. As an asteroid specialist, Chapman noted that he was thrilled by the images produced by Hayabusa, but very disappointed about the loss of MINERVA. "Remember this is a proof-of-concept engineering mission, not a science mission," Chapman explained. "We really do have to learn how to operate in the vicinity of an asteroid if we are ever going to use them for space resources or if we are going to have a reliable capability to deflect a dangerous one," he told SPACE.com.